Enjoy Hitch Club merchant benefits including just 2.4% CardUp fee^ (usual: 2.6%) on unlimited transactions after completing min 1 Hitch ride! More info here. 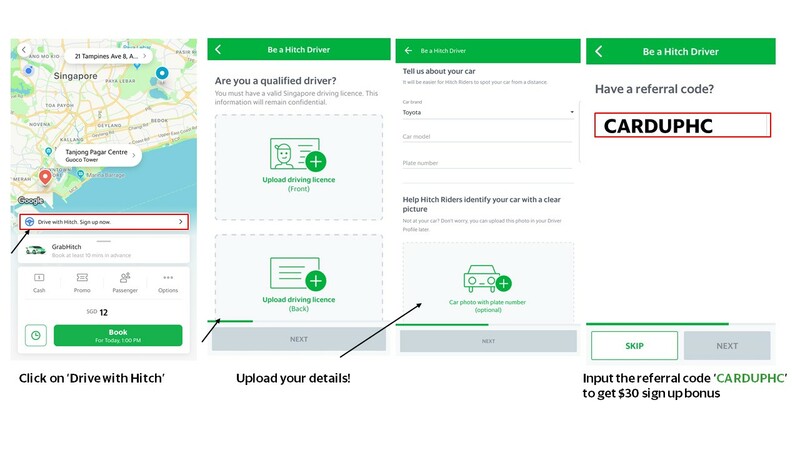 Get $30 when you signup and complete your first ride as a GrabHitch driver with referral code CARDUPHC* by 31 January 2019! New drivers must sign up with the referral code CARDUPHC in order to qualify for the $30 credit.The processing of the $30 credit will only be conducted at the end of each month, i.e. 31st January. Thereafter, please allow up to 10 working days for the disbursement of the $30 credit into your Hitch Driver wallet. Have questions? Email us at support.sg@grab.com with subject “CARDUPHC” and we will get back to you in 2-3 business days.